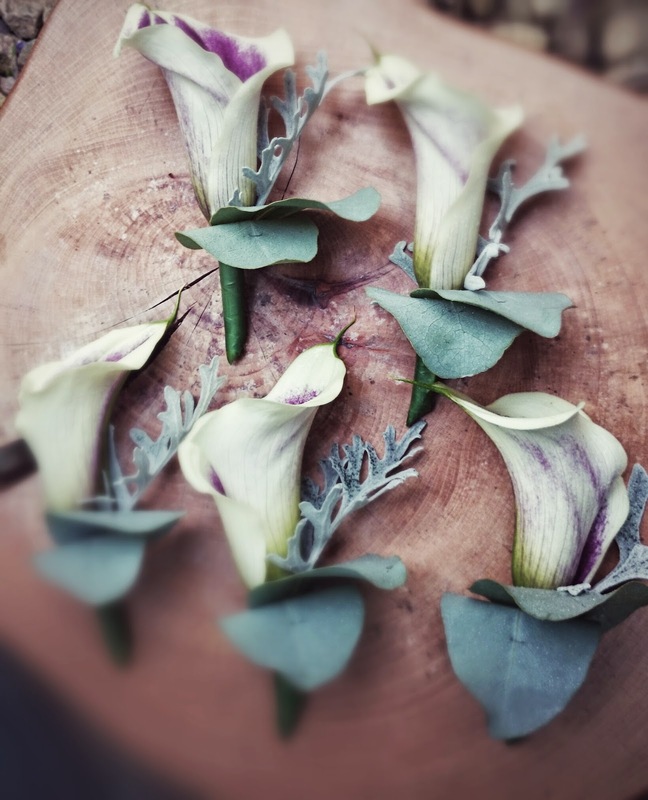 I was lucky enough to be invited to design and create the florals for this totally stunning wedding inspiration shoot. 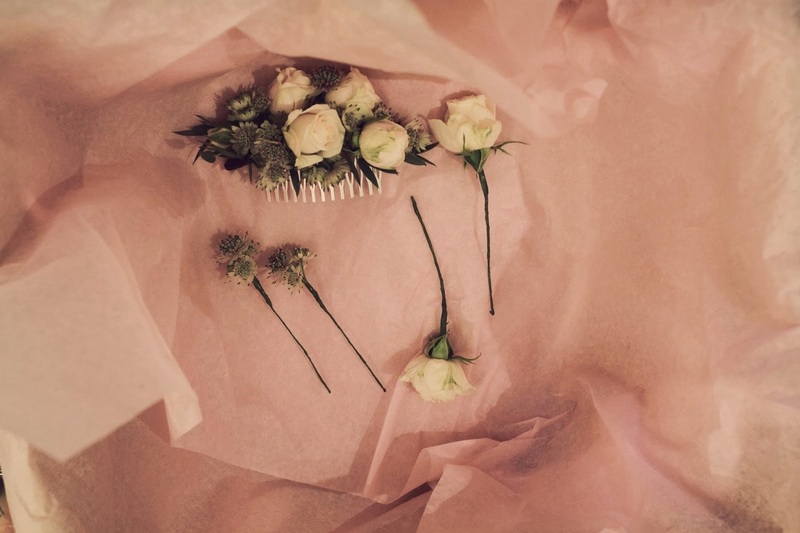 Inspired by Jane Austen’s Sense and Sensibility – such a unique and romantic theme. 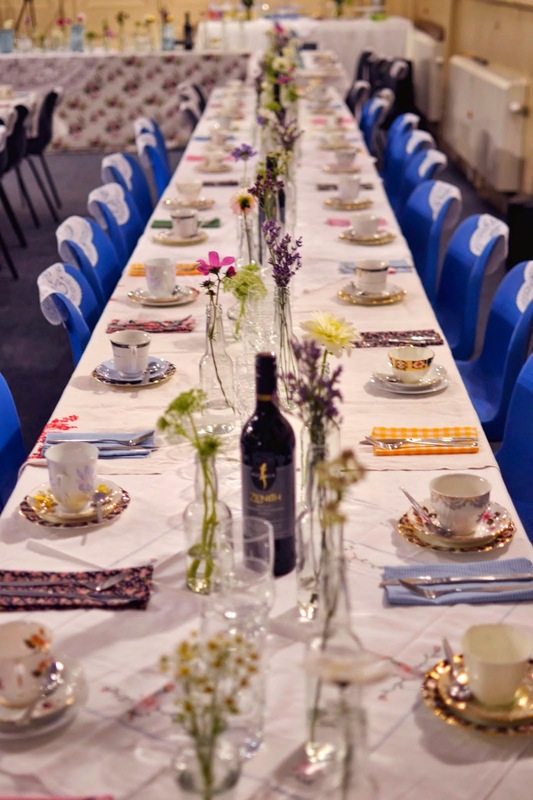 It took place at the incredible Purton House in Wiltshire. 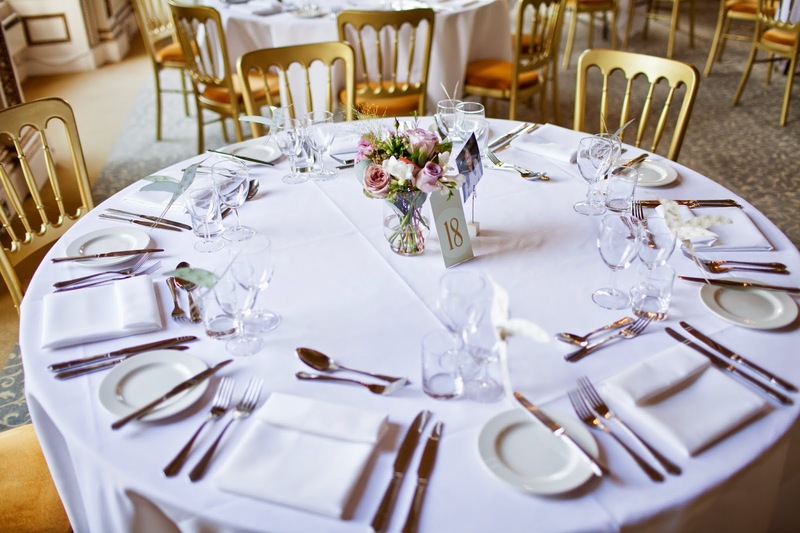 The shoot was created with a beautiful modern twist on the Regency style. It had a soft romantic feel and a delectable duck egg blue and grey colour palette. 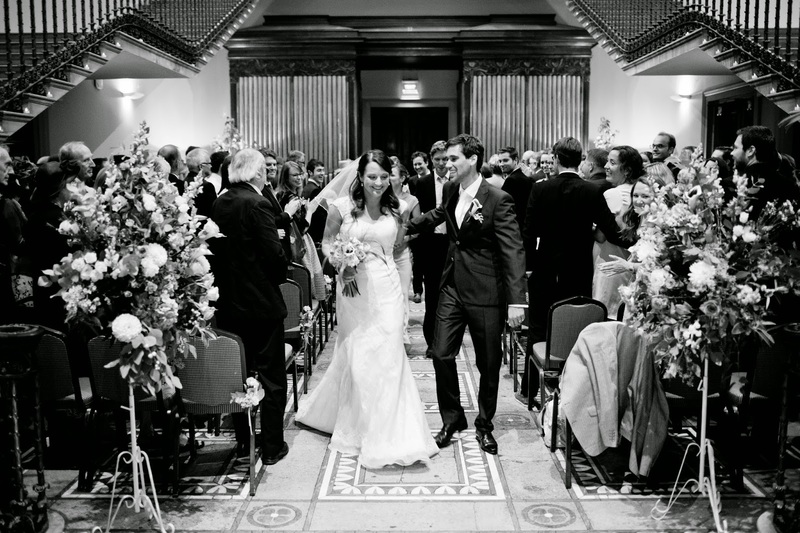 It was of course full gorgeous Spring flower wedding inspiration. The shoot took place in April. 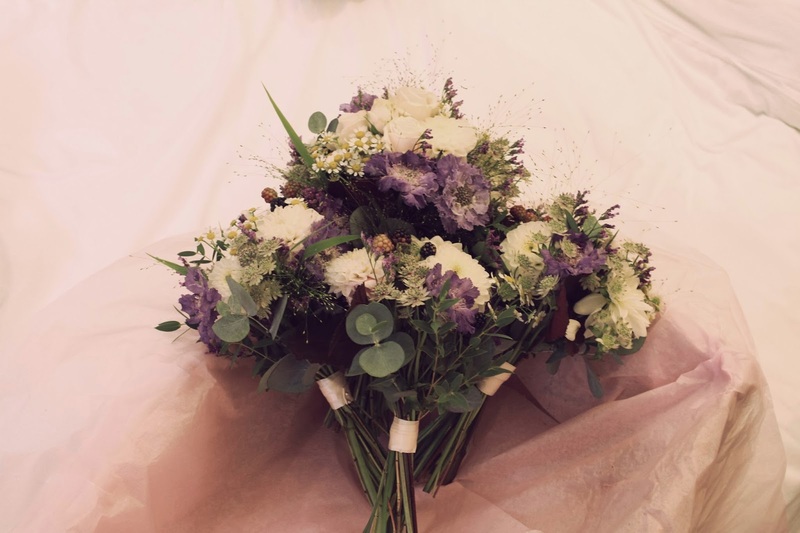 I wanted to use seasonal spring flowers that had a luxurious but also soft and delicate feel. It was important they gave a natural informality to fit with the regency inspiration. 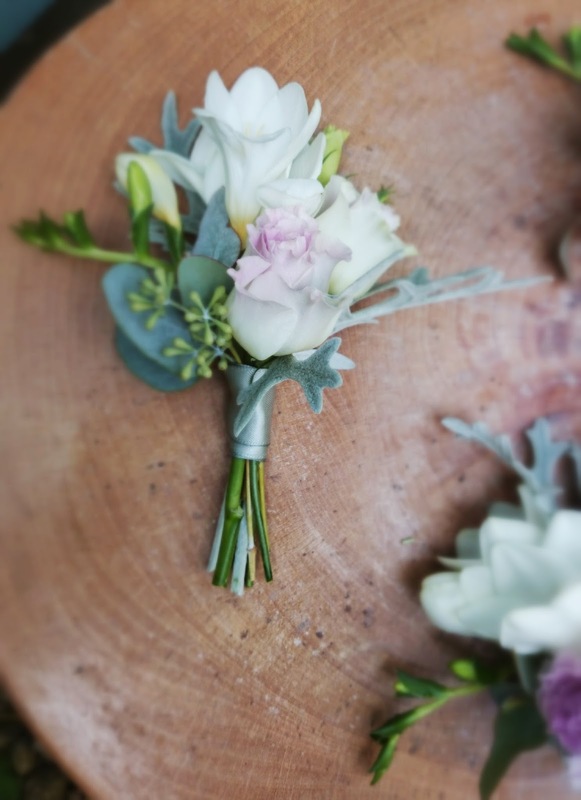 I chose stunning White O’hara garden roses, stunning majolica spray roses, hellebores, white ranunculus, lily of the valley, muscari and trailing asparagus fern. They all worked together to give a beautiful, romantic Old English feel to the designs. Hello! I’m Meg a wedding florist in Bristol. Welcome to my next Shed Scenes blog post. 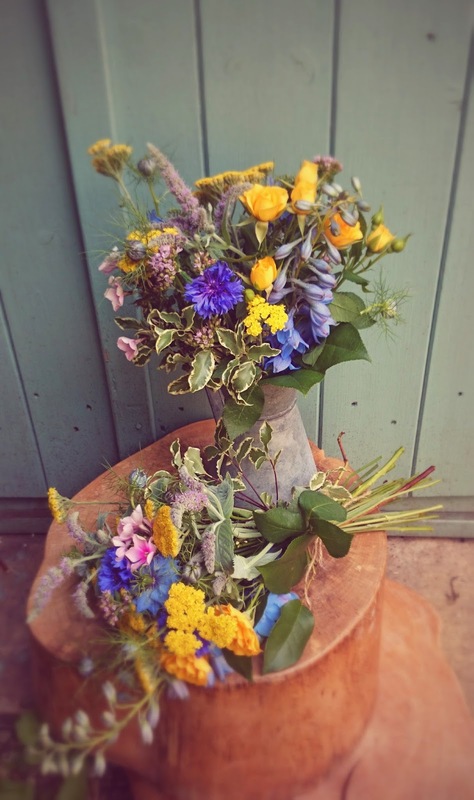 A behind the scenes look at my floral goings on as I beaver away in my flower shed in the heart of Bristol. 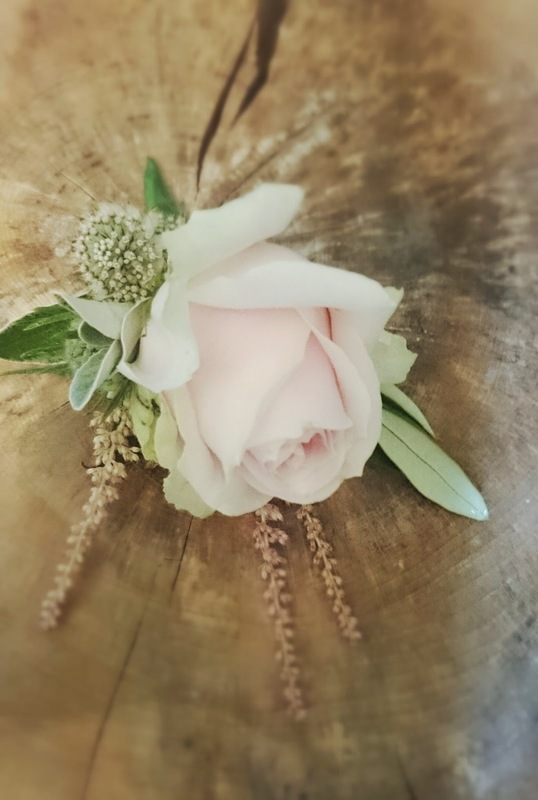 I love to snap away as I work and record the process as I put together my lovely couple’s wedding flowers. 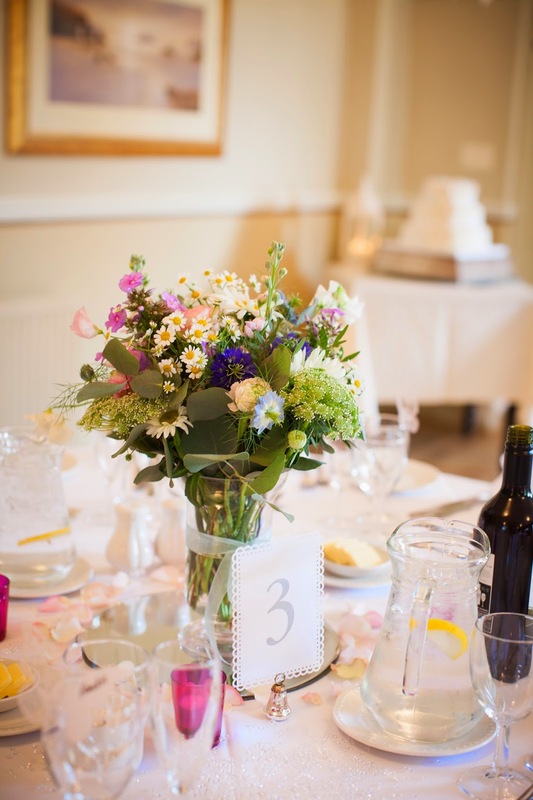 A beautifully relaxed wedding full of lovely personal touches. 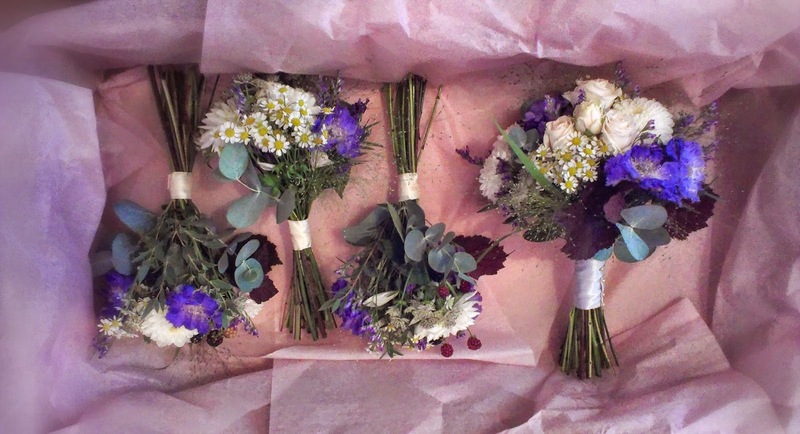 I was truly honored to be asked to create florals for Polly and Nathan’s wedding day. They wanted elegant, sophisticated designs with an informal, thrown together feel. 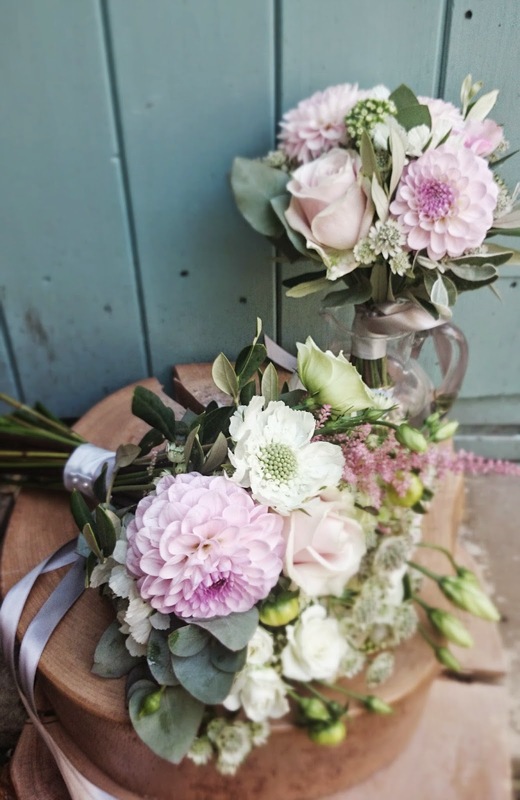 Together we came up with a beautiful blush, ivory and lavender colour palette. 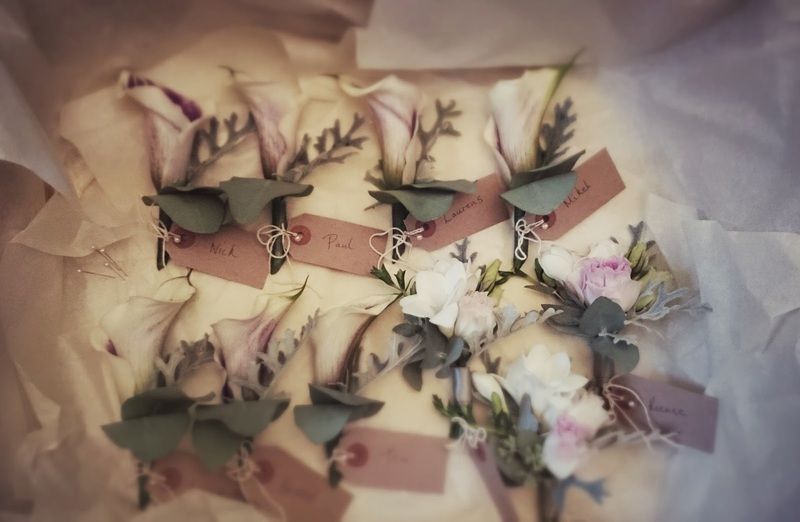 They a chose a loose, natural style for the Bride and bridesmaids bouquets, boutonnieres for the boys and lovely ‘thrown together’ flowers for their reception at Barley Wood in Jam jars, bottles and demijons. 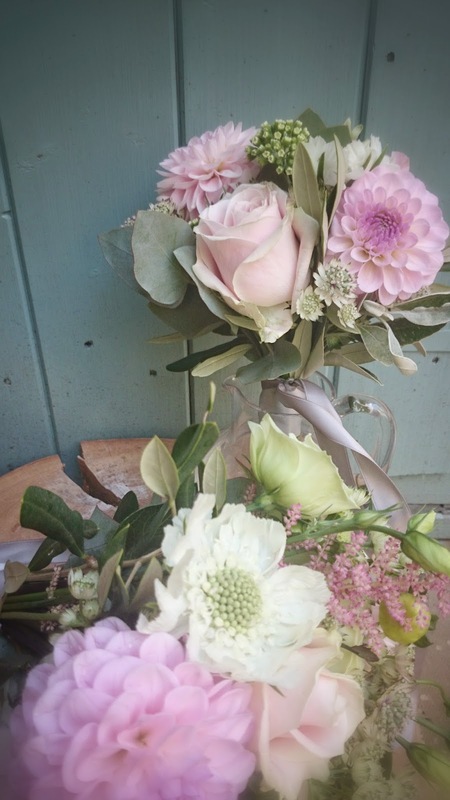 I used a lovely English Summer mix including Garden roses, stocks, larkspur, campanula, astrantia and scabious. 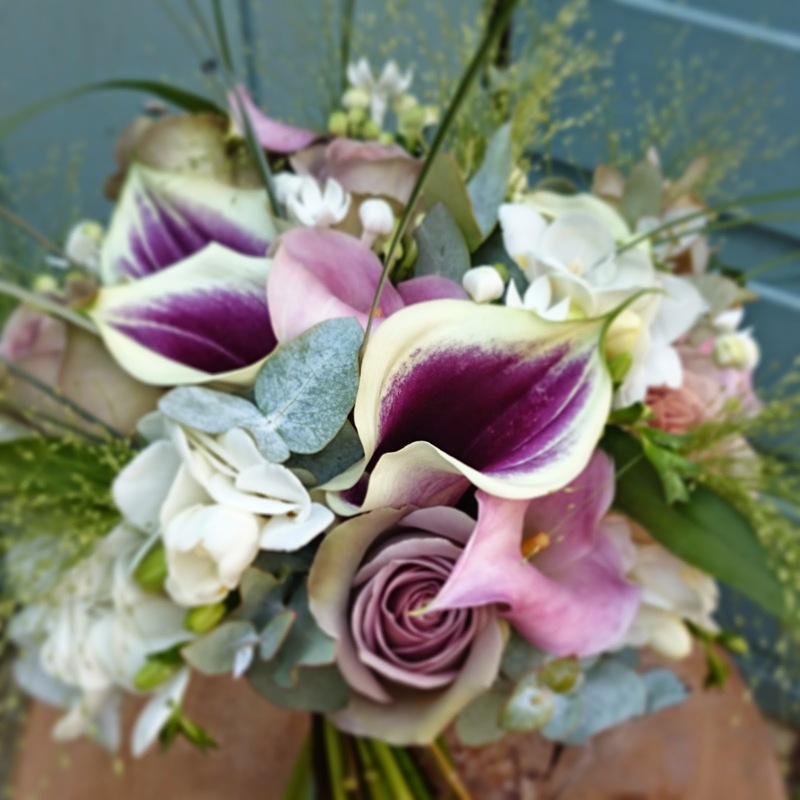 Polly requested that lavender and ferns were included in memory of her lovely mum and Newzealand. I included dried lavender and 3 types of fern in the final design which added such a beautifully unique and personal touch. I can’t wait to see the professional pics from the day! 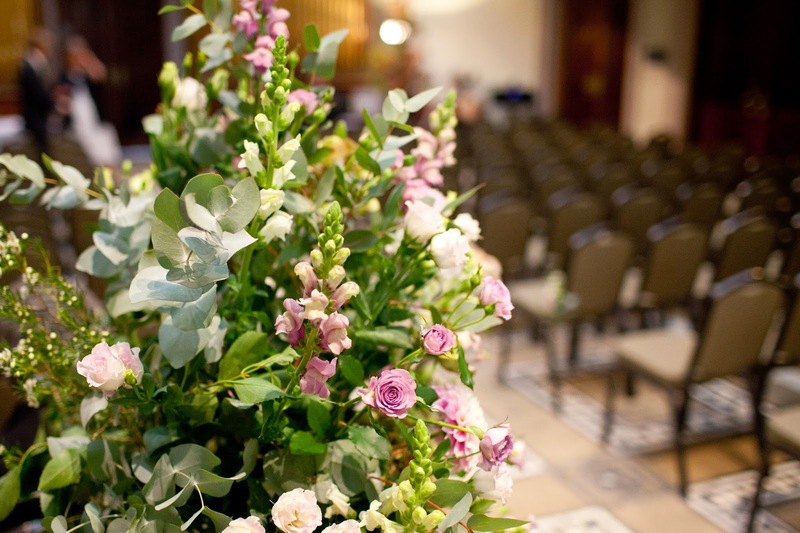 Very happy to share Bethany and Stephens beauuutiful wedding flowers with you. I loved putting this timeless, elegant early English summer design together for them. It was lovely to work at the icredible Orangery at Goldeny Hall in Bristol. Such a stunning venue! 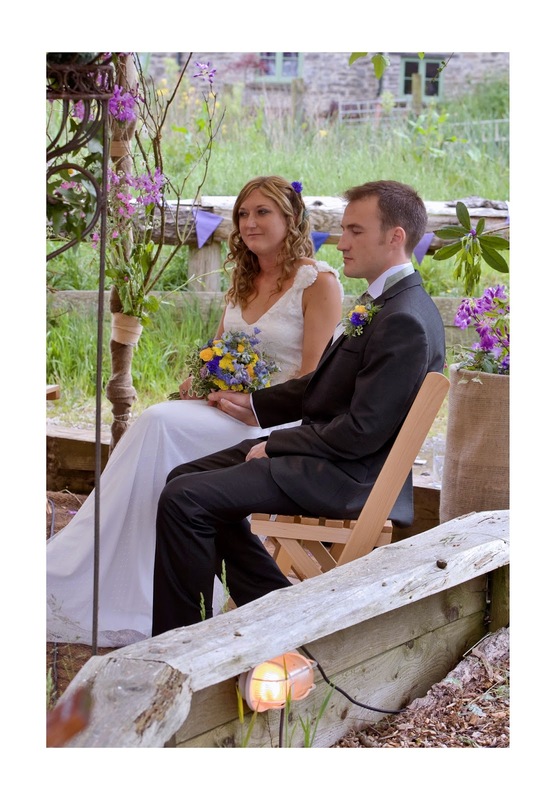 Bethany and Stephen wanted an informal, simple and elegant feel to the flowers for their wedding day. 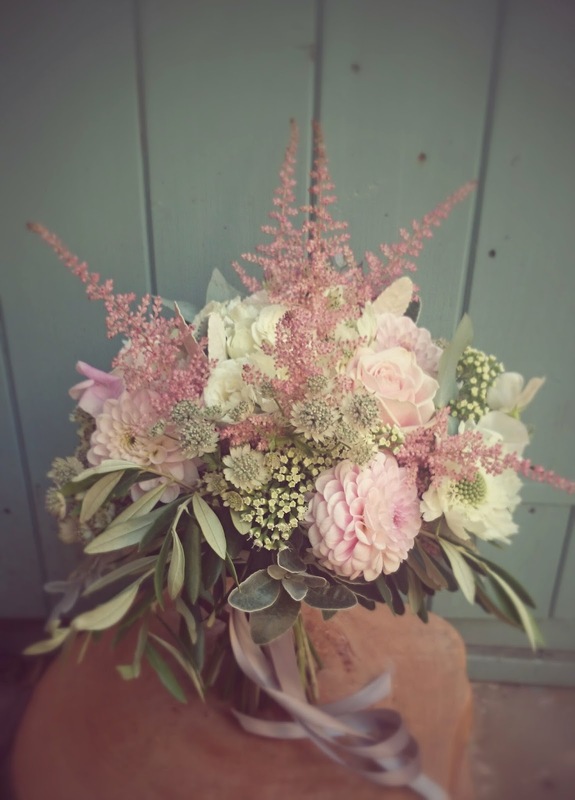 They asked for a soft pink and ivory colour palette with beautiful seasonal flowers and gorgeous foliage. 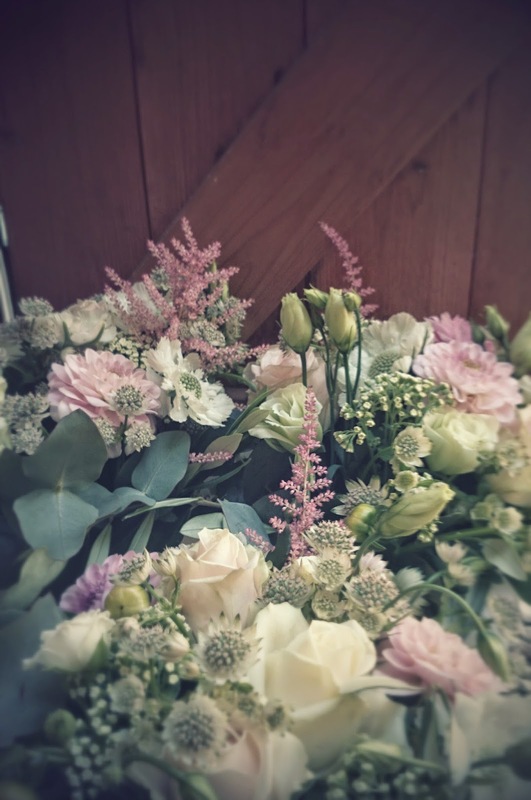 With the wedding being held in mid June there was an abundance of incredible summer blooms for me to choose from when putting their design together including delicious peonies which of course everyone loves and are a total joy to work with! 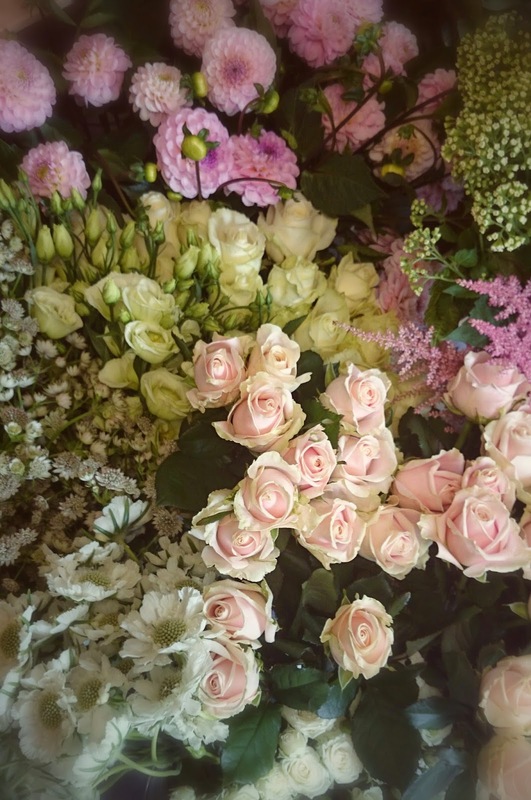 I chose an lovely mix of early summer blooms with lots of scented varieties such as stocks and beautiful pale pink Gardenia peonies. 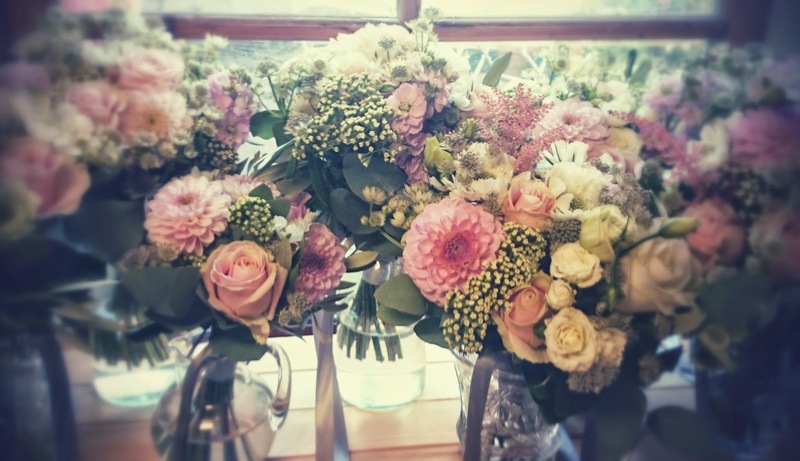 I also included Hydrangea, Sweet Avalanche roses, spray roses, scabious and astrantia. 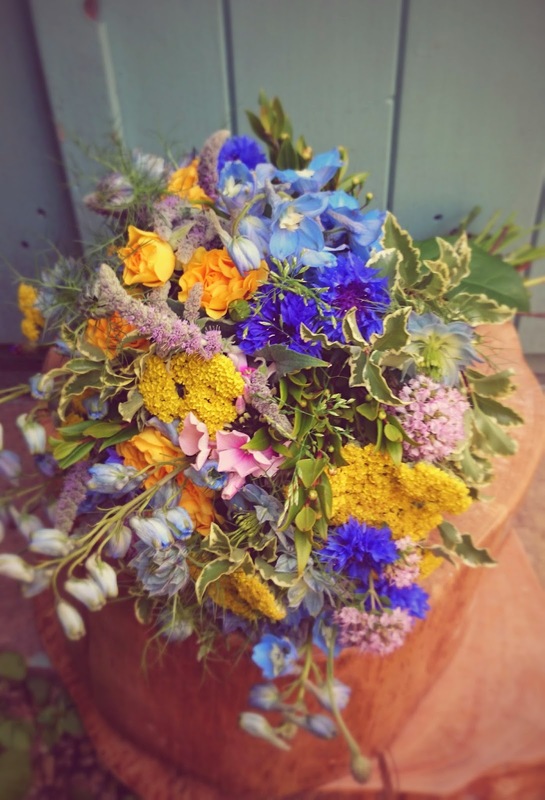 I’m Meg a wedding florist in Bristol with a love of beautifully wild, gorgeously unruly wedding blooms. 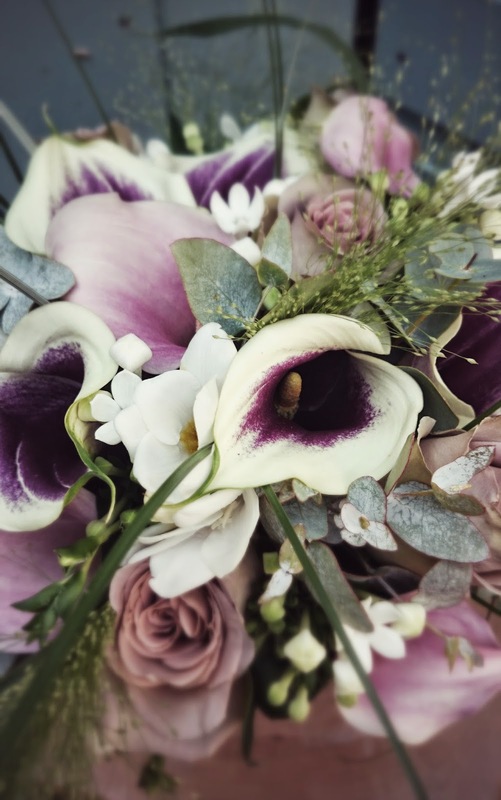 I’m so happy to share my latest wedding flower inspiration blog full of hints, tips and advice to help you choose perfect wedding florals as unique as you are. 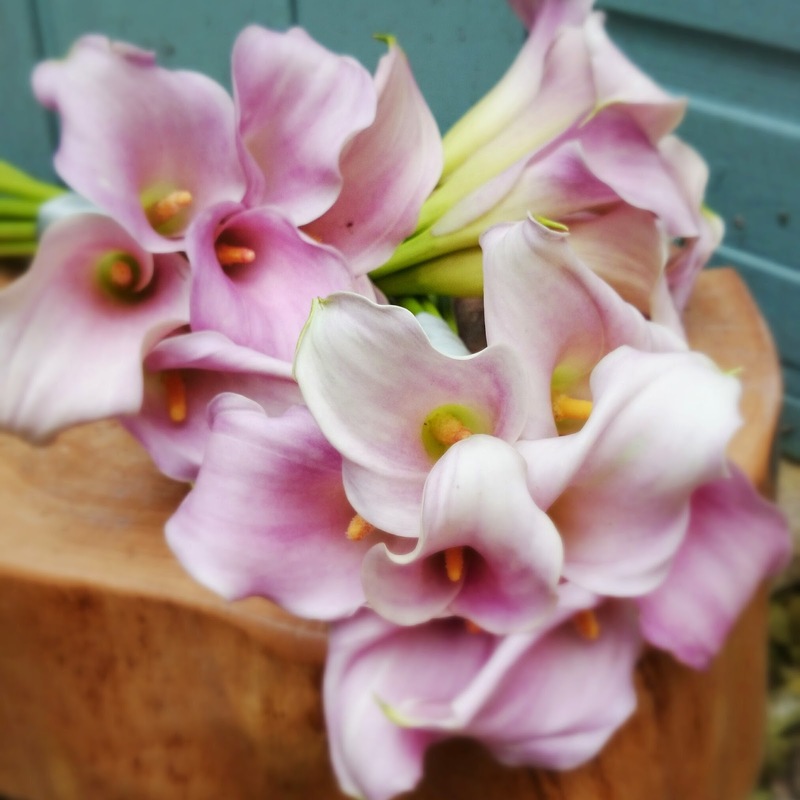 I love nothing more than getting creative with my beautiful, seasonal blooms in my lovely little flower shed at the end of my garden. 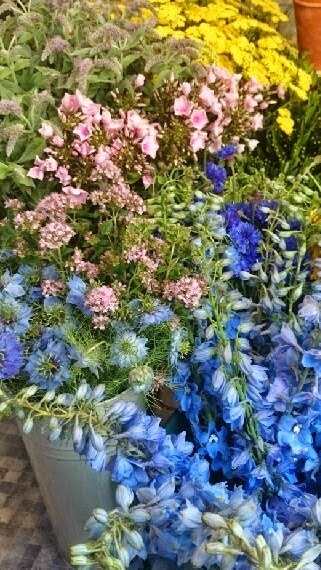 Enjoy the floral faffery! 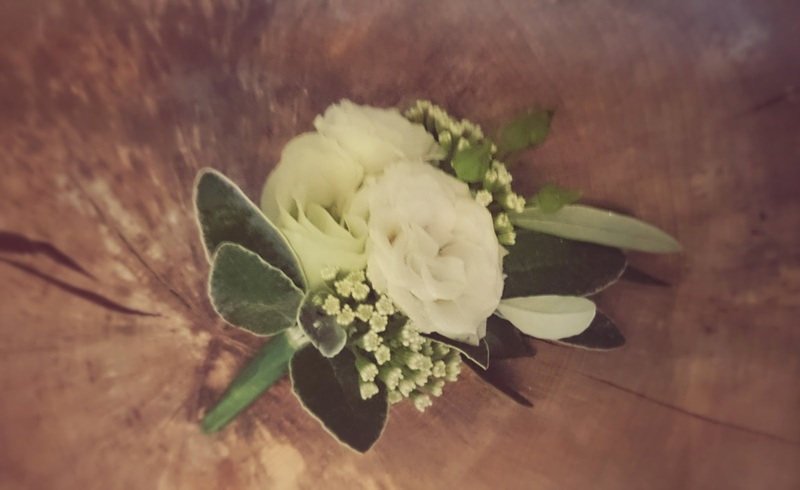 A beautifully delicate, loose and natural bridal bouquet made using ‘winter moving into spring’ flowers, foliages and berries with a romantic matching Grooms buttonhole. I love this time of year as Spring is on the horizon. The days are getting longer and warmer and beautiful spring flower varieties are starting to emerge bursting with life and energy. Anemones are my absolute favourite flower, especially the paler varieties with dark blue black centers, so elegant but with a wildness about them. 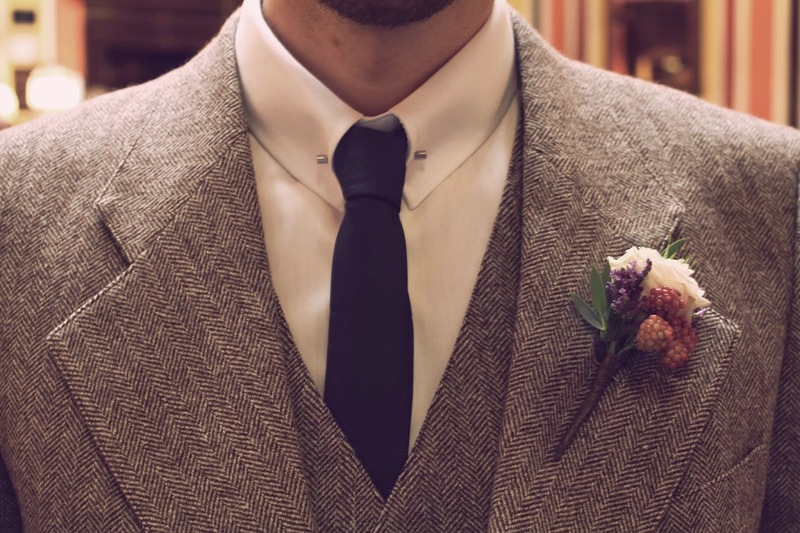 These designs are perfect for a January or February wedding. 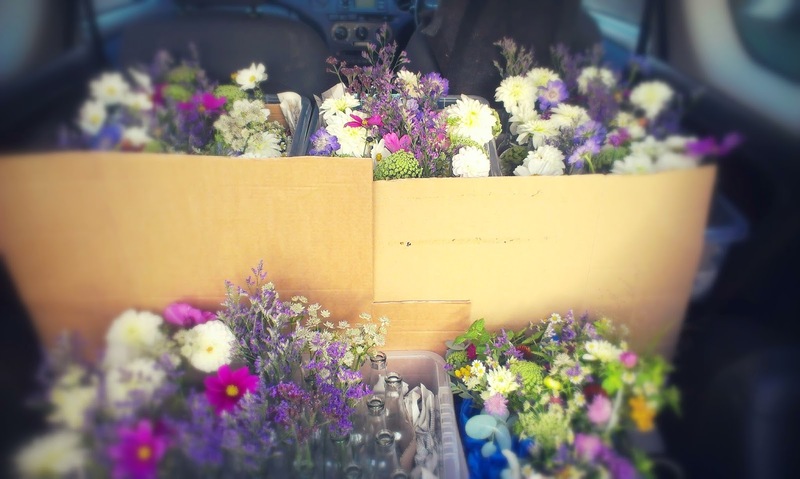 They are packed full of Anemones and Ranunculus which are beautiful to use at this time of year and throughout Spring. The lovely helebore with their delicate nodding heads add a touch of winter. 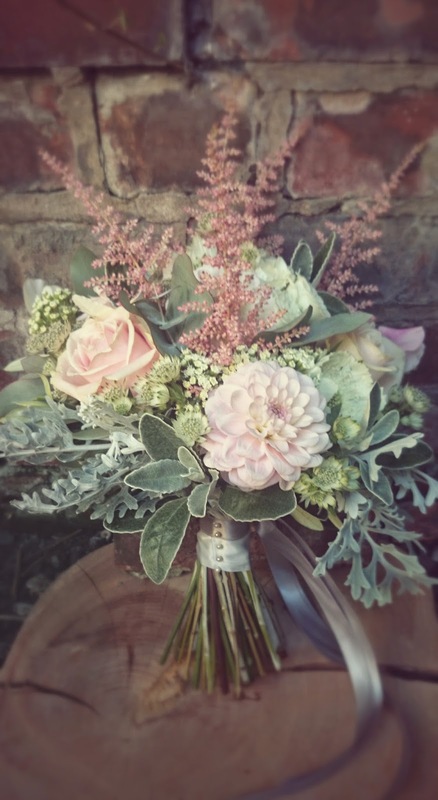 The amazing jewel like viburnum berries and delicate Astrantia to give texture and depth. 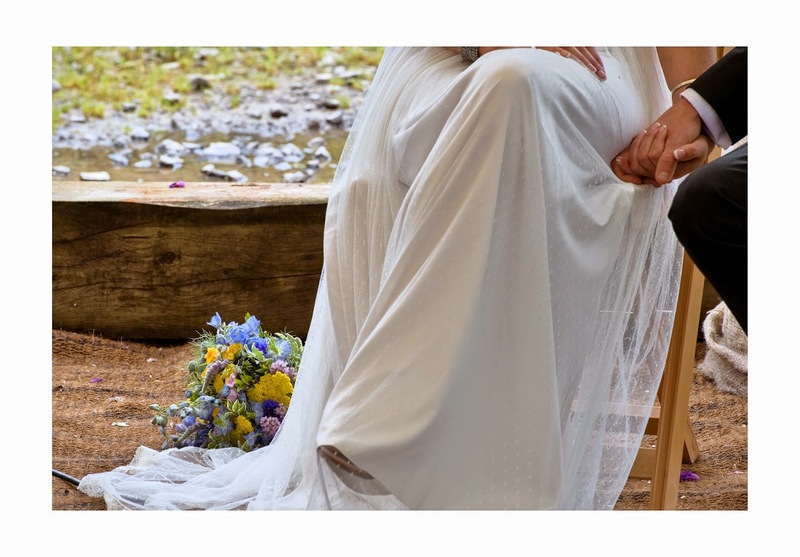 I just loved designing this wedding. 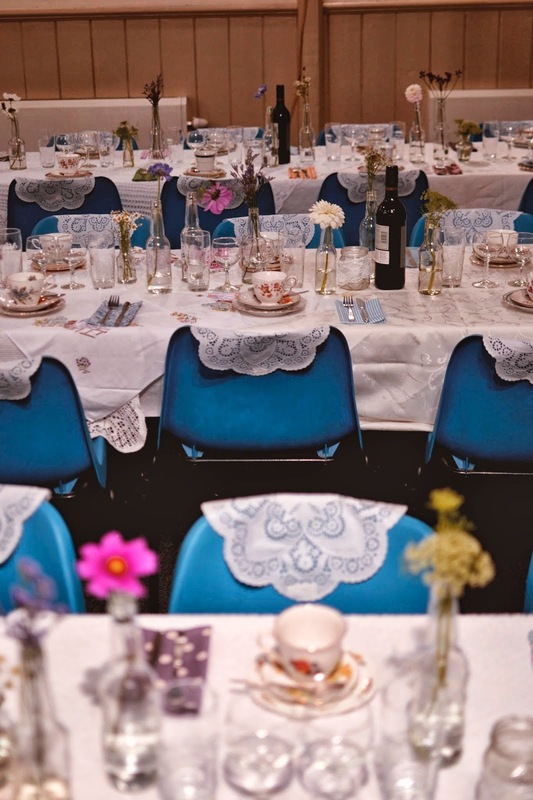 Richard and Karen wanted a beautifully simple vintage style to their day. 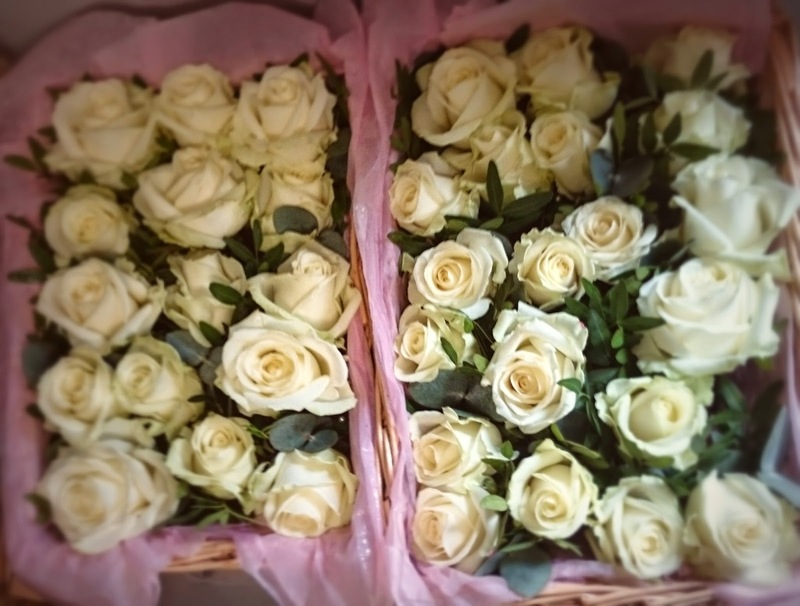 Full of roses and seasonal summer flowers. The colour palette is so stunning with dusky pale pinks and lavenders and just a touch of dark aubergine tones giving it depth. 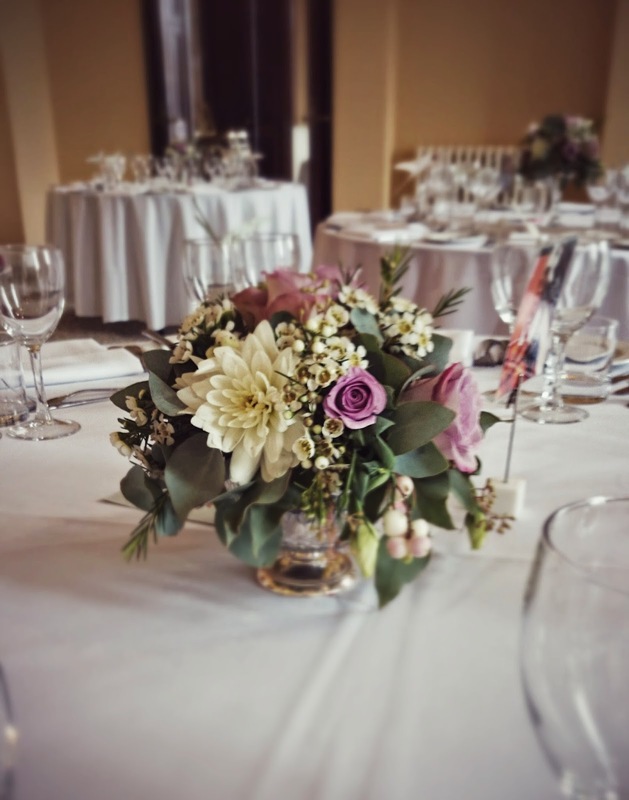 I was so excited about creating the florals for their wonderful outdoor ceremony in the gardens at the Mansion House in Clifton. 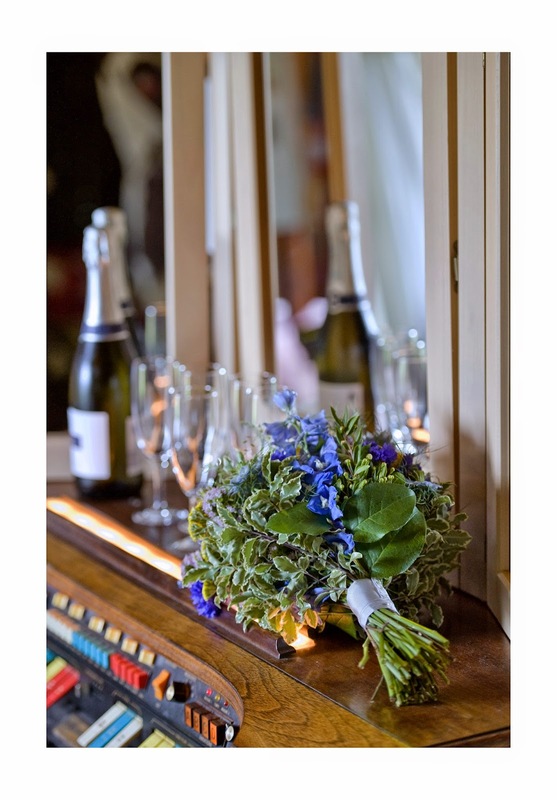 It does not disapoint, beautifully informal and luxuriously full of vintage summer flowers. Beautiful photography by Martin Dabek. 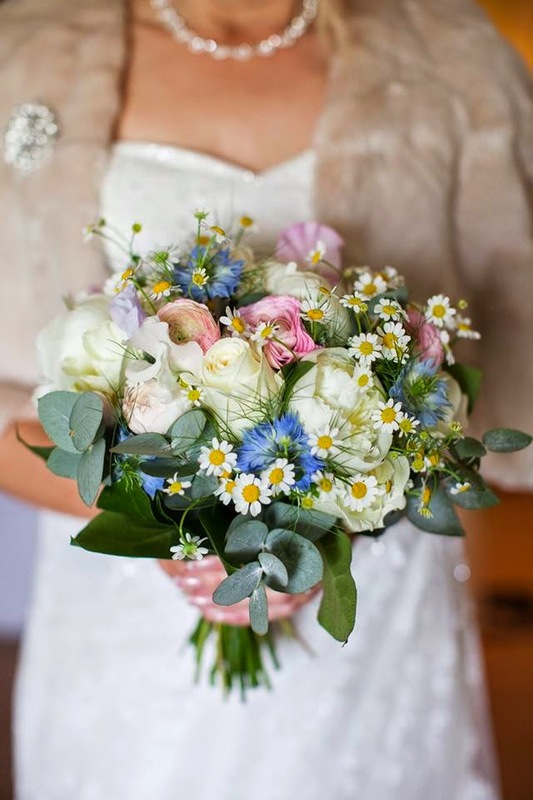 Such a beautifully feminine mix of flowers. 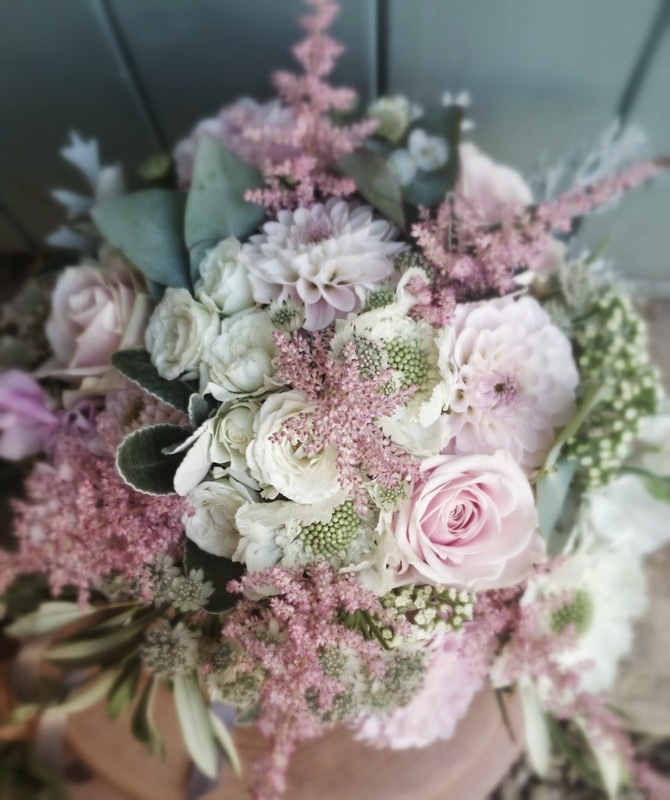 Karens bridal bouquet was created using a wonderful mix of roses and astrantia which creates a lovely softness. It contained Blue Curiosa rose, Quicksand rose, Sweet Avalanche rose, Memory Lane rose and white astrantia with eucalyptus foliage. 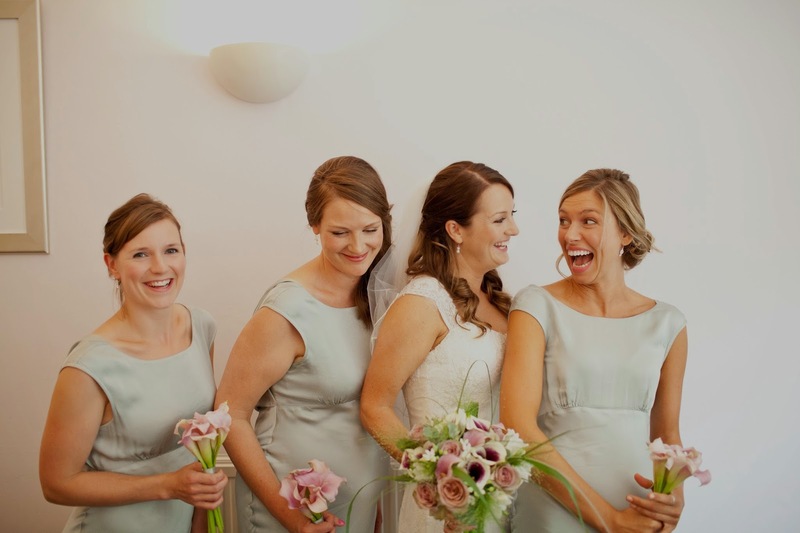 A lovely vintage wedding with a soft and romantic feel. 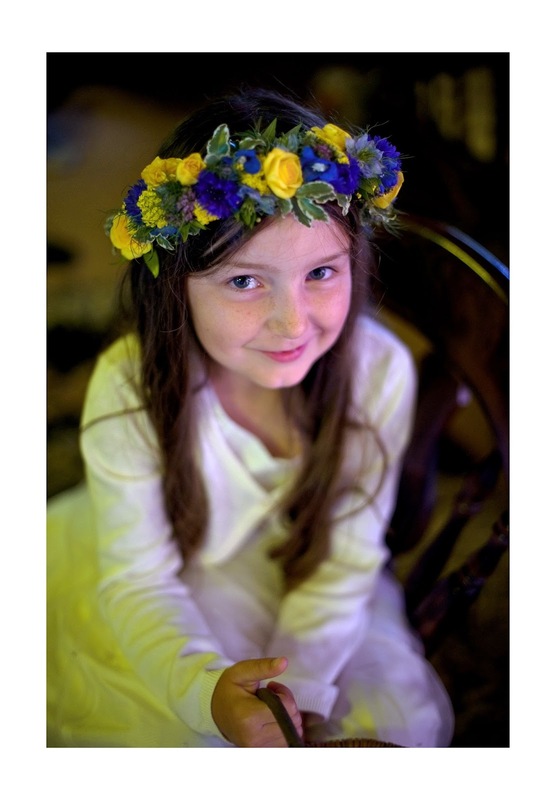 Alice wanted flowers with a natural and informal look. 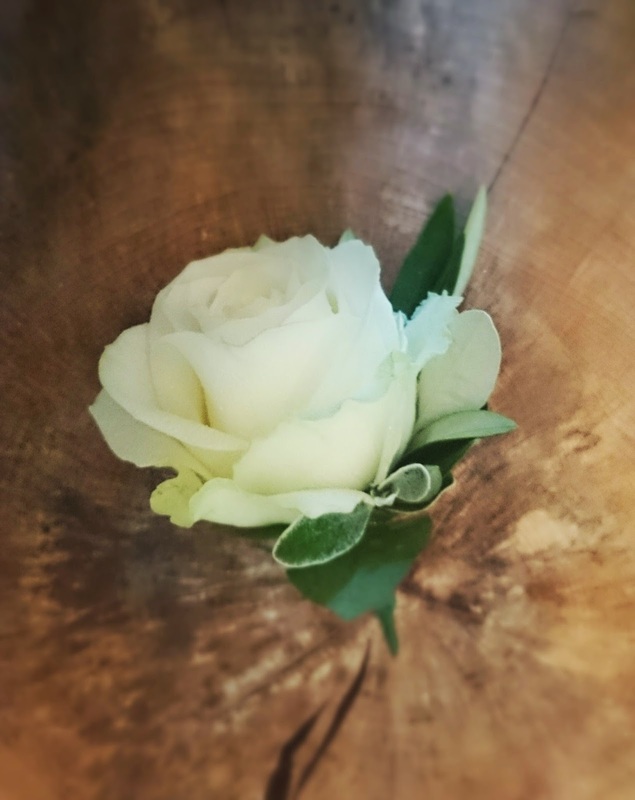 Together we chose a pale, dusky colour palette including beautiful Amnesia roses – my absolute favourite with their beautiful faded look. 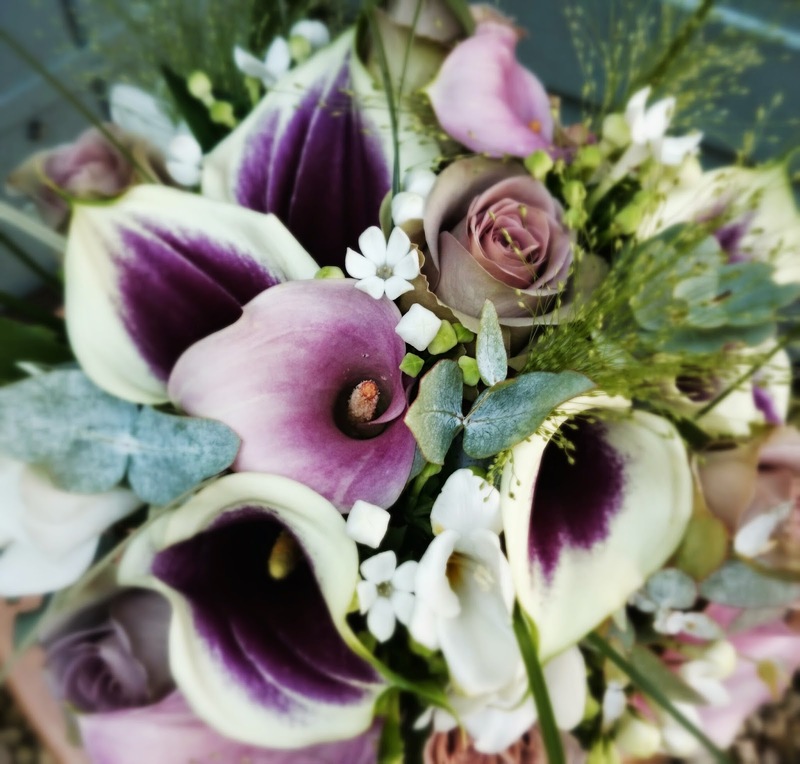 She wanted her bouquet to include some stronger colours which I added with gorgeous Vermeer calla lilies. I am a big fan of making the most of your flowers on the day. 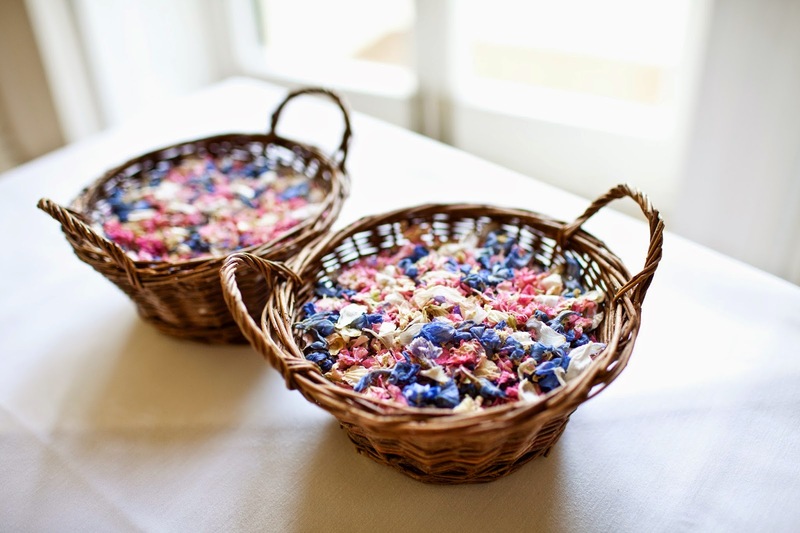 All the flowers used in the ceremony were re-used for the reception. The pedestals were moved so they could be enjoyed all day. 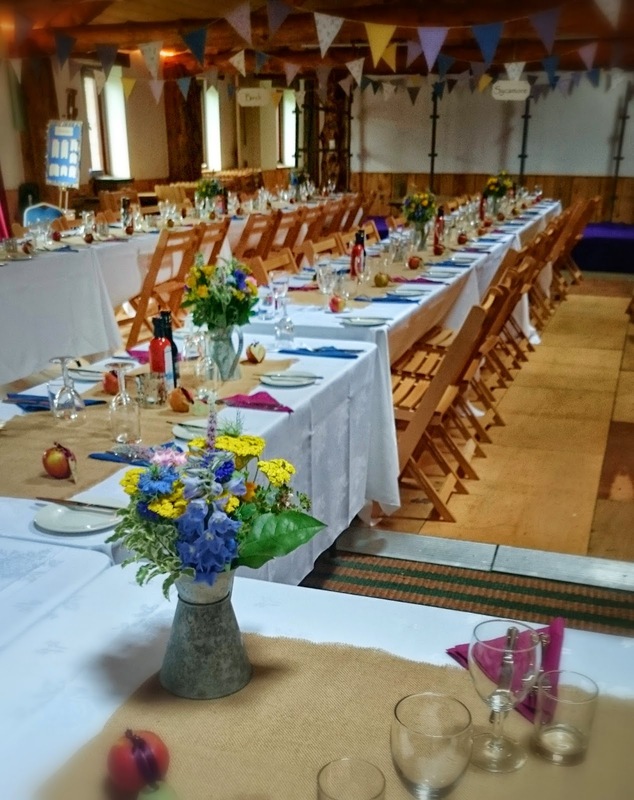 I provided ribboned jam jars which the pew ends were placed in and used as extra decoration for the wedding breakfast. 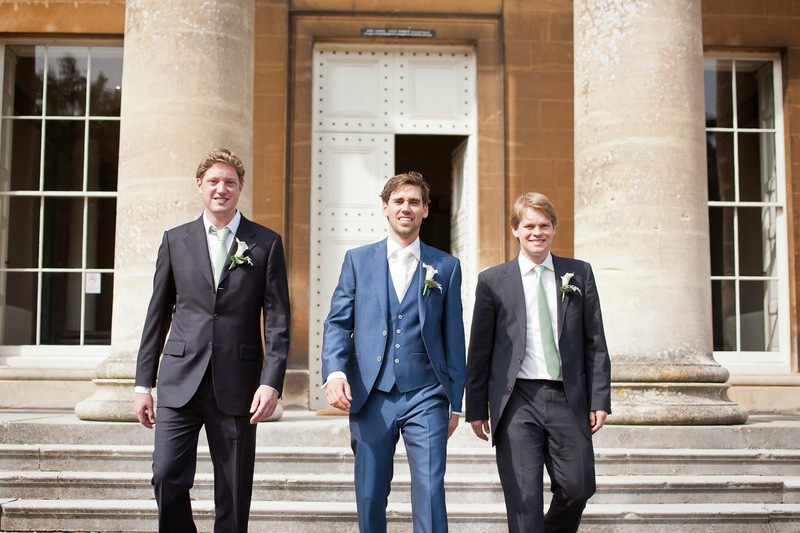 The wedding and reception took place at the lovely Leigh Court just outside Bristol. 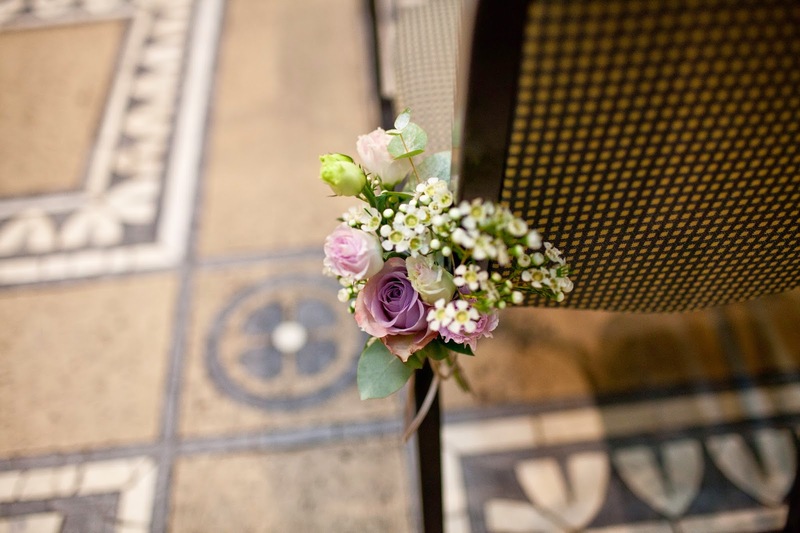 The vintage style of the flowers for this wedding worked so well in the venue. 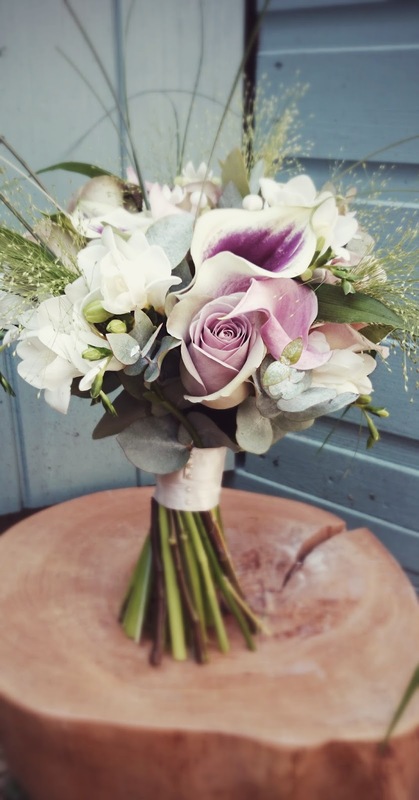 A scrumptious mix of seasonal flowers in romantic dusky pinks and ivory for this lovely Bristol wedding. 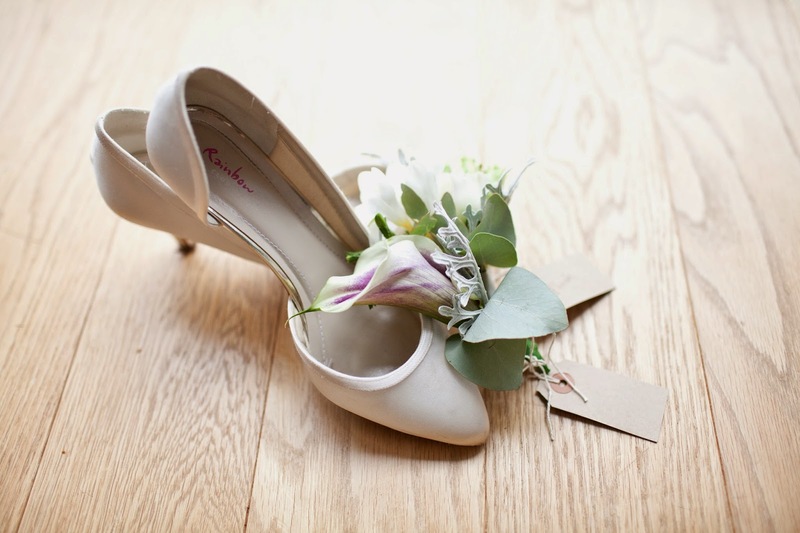 Isobel was clear from the start that she wanted an informal, natural look for her wedding flowers. Just what I love to create! With 9! bridesmaids Isobel decided to use the maids bouquets as the table centres for the reception after the ceremony. 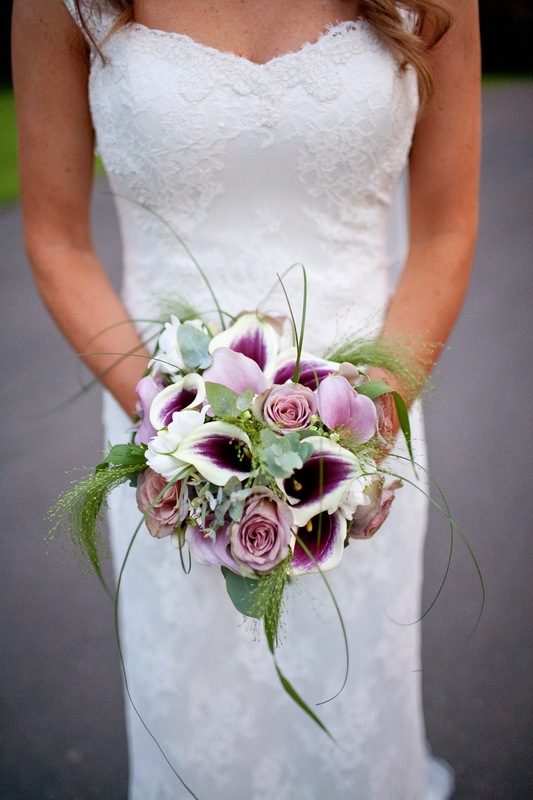 The loose, natural look of the bouquets meant they were perfect for both jobs. 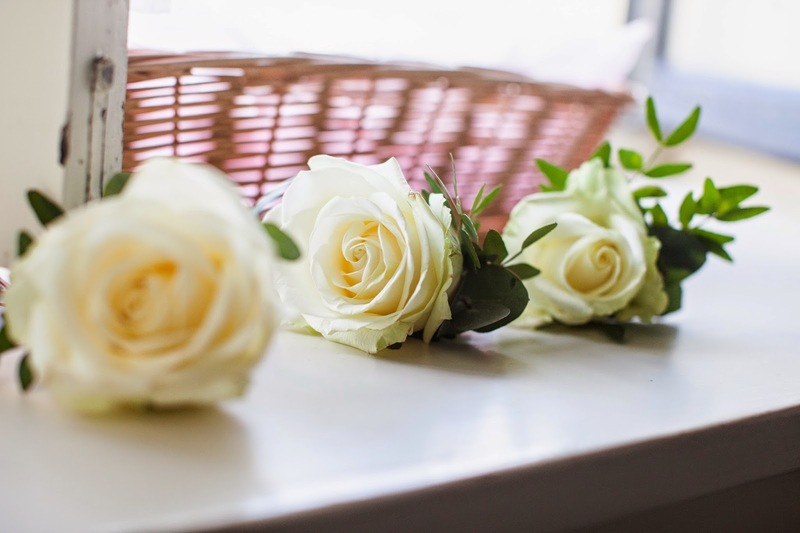 Re-using your flowers throughout different parts of your day is such a good idea and is something I am always advising my brides and grooms to do. It means you can really make the most of them. 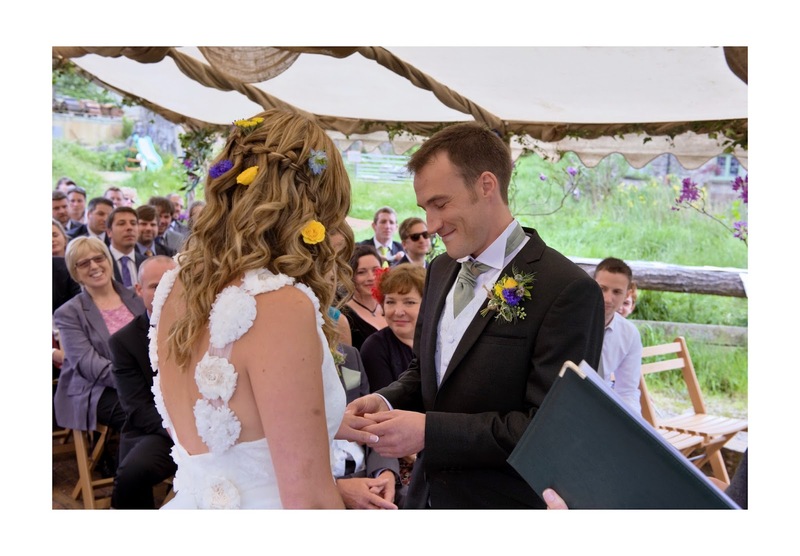 Alex and Isobel were married at St Mary Redcliff church in Bristol with the reception at M Shed. Beautiful spring flowers with a daisy theme. Delicate pastel colours and a natural, countryside feel were key to the designs. It was important to John and Louise that their flowers had a lovely scent. 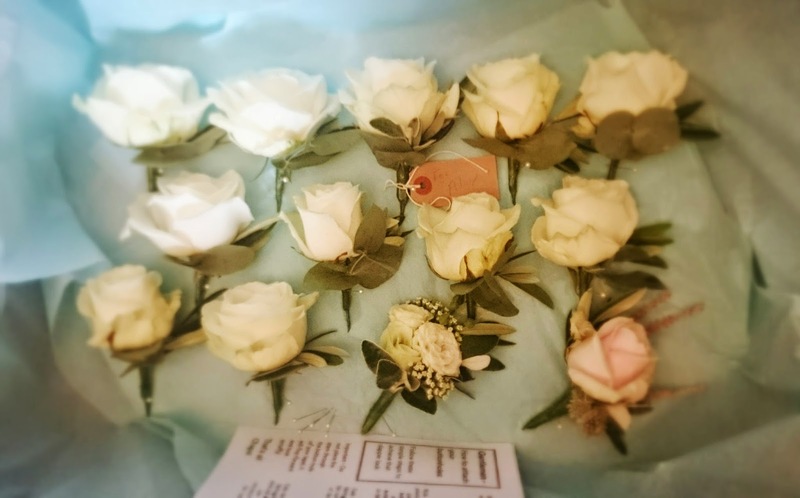 With stocks, sweet peas, scented peonies and scented roses all included they smelled heavenly. 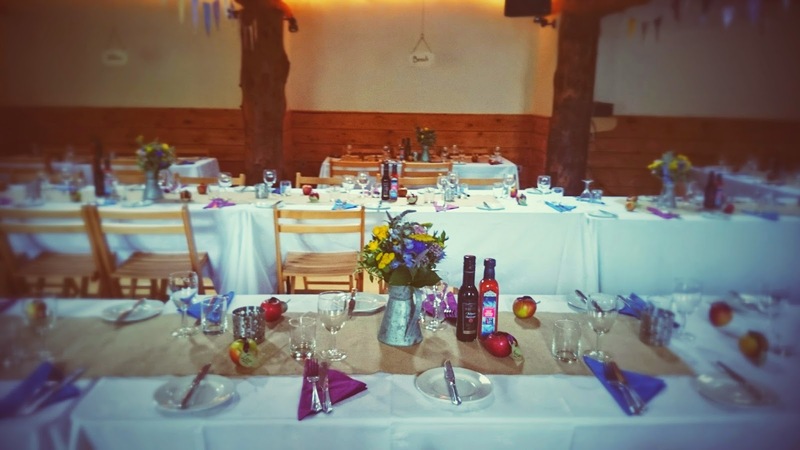 John and Louise decided to hold a wedding renewal in celebration of their 25th wedding anniversary and I was honoured to help with their celebrations. I loved creating these designs, so so pretty! I hope you agree. 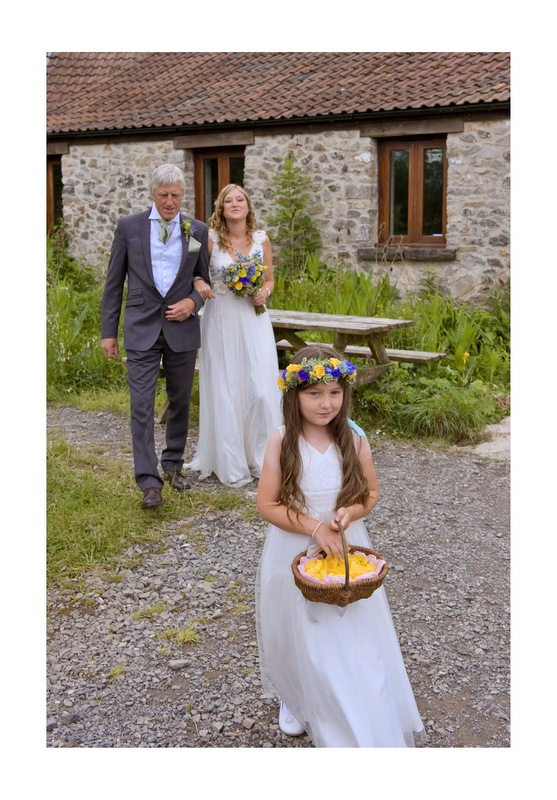 A gorgeous Somerset countryside wedding on a farm in the Mendips. 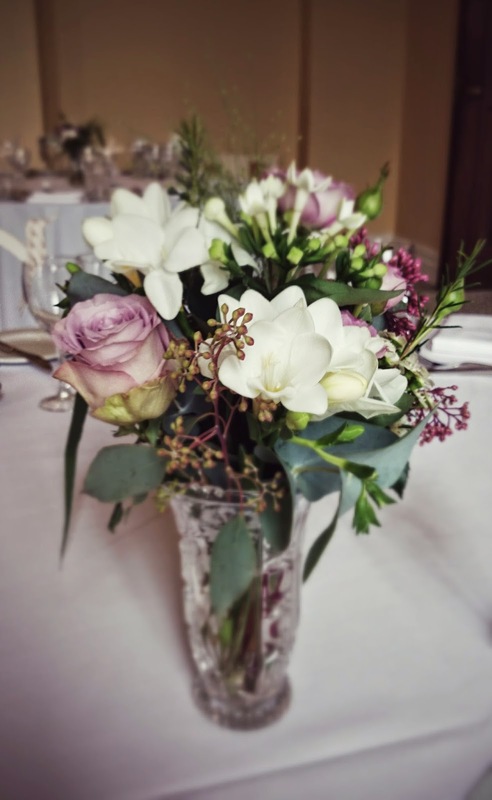 With this couple wanting a natural, informal style for their flowers this wedding was my cup of tea! 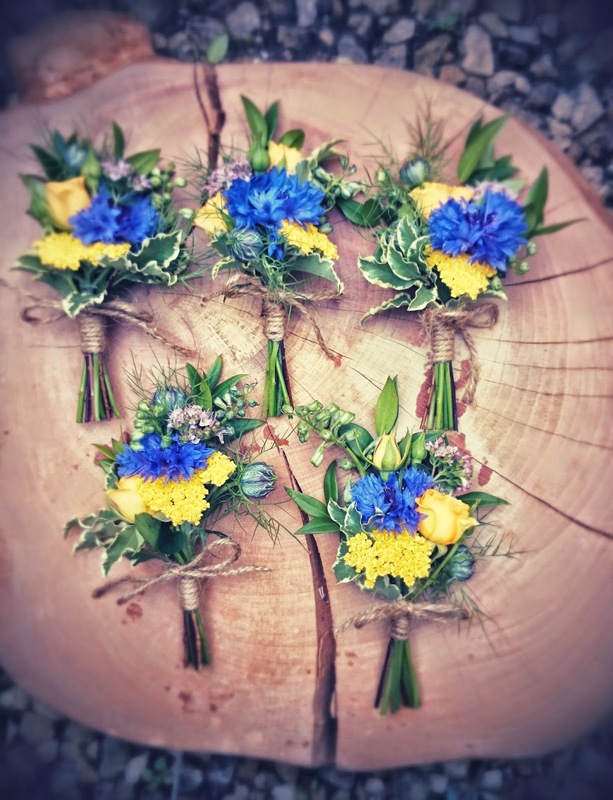 They chose the beautiful colour scheme of blues and yellows with a dash of pink. 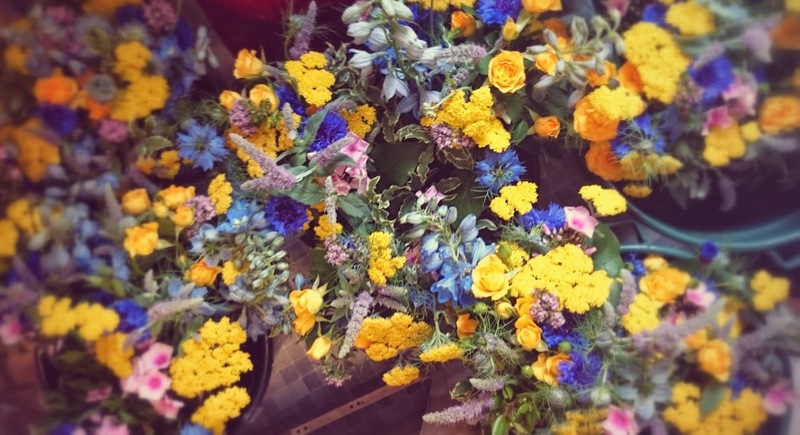 Sam was very relaxed about what flowers I used, just wanting seasonal, early summer flowers that would fit in with the rustic, informal feel of their day. 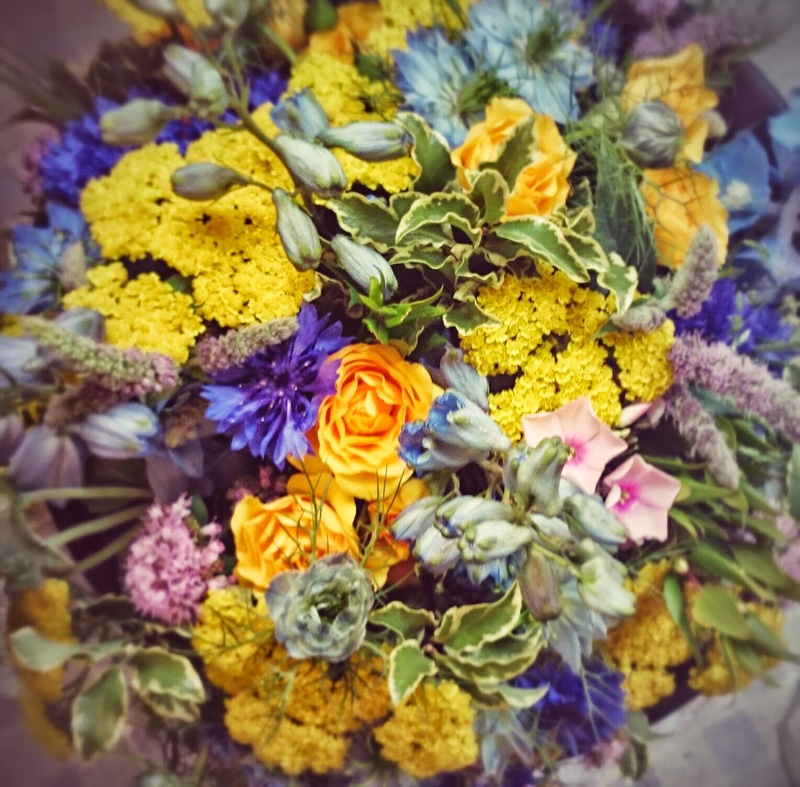 Sam’s lovely bouquet of Delphinium, Cornflower, Nigella, Phlox, flowering Oregano, Flowering Mint, Achillea and Spray Roses. I just love this colour combination. 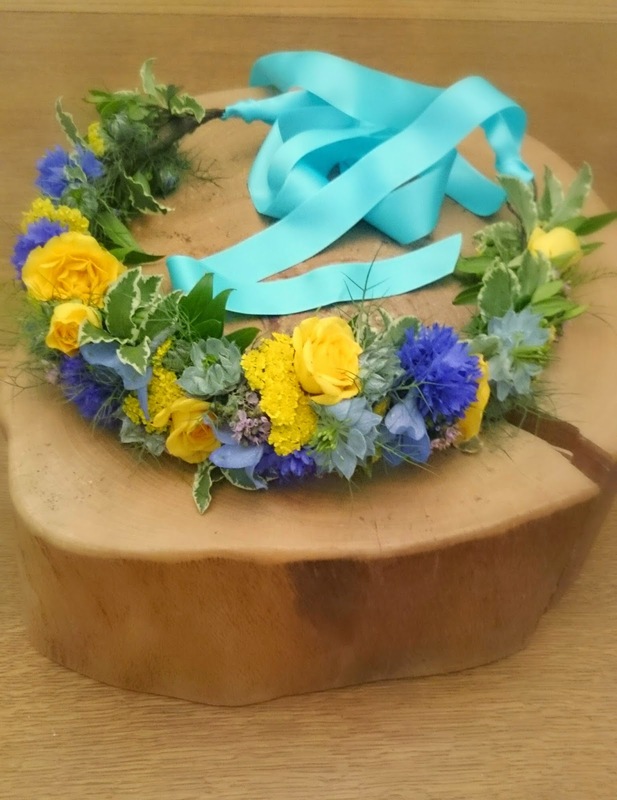 A flower crown for Sam’s Flower-girl. I think this is so gorgeous in this colour combination. Lovely table centres in metal jugs. I kept these very loose to help create a more rustic, informal look. 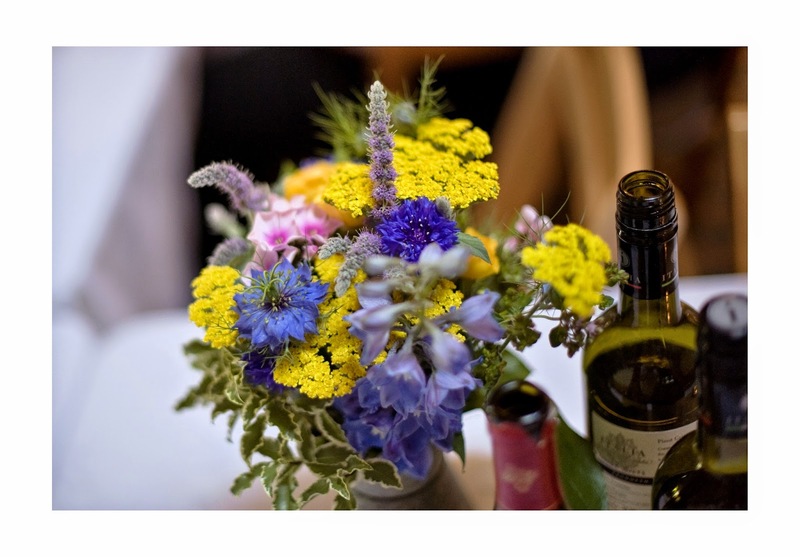 These were placed on long tables for the wedding breakfast. 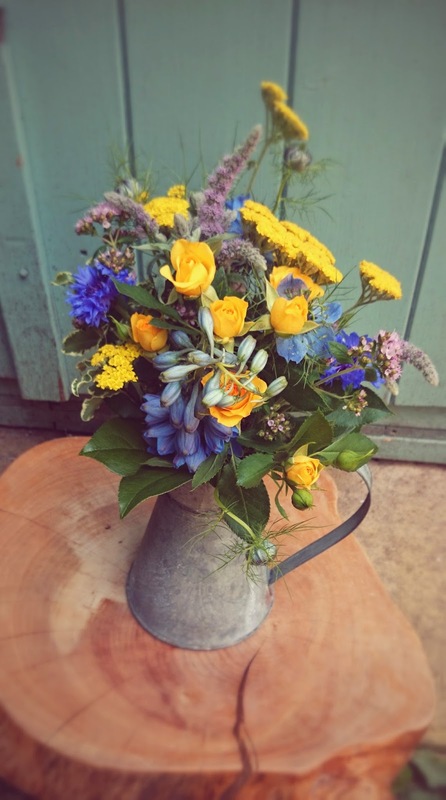 I wanted the designs to look as if I had taken a walk through the Somerset countryside grabbing handfuls of flowers although I can promise you I put a lot more effort into them than that! 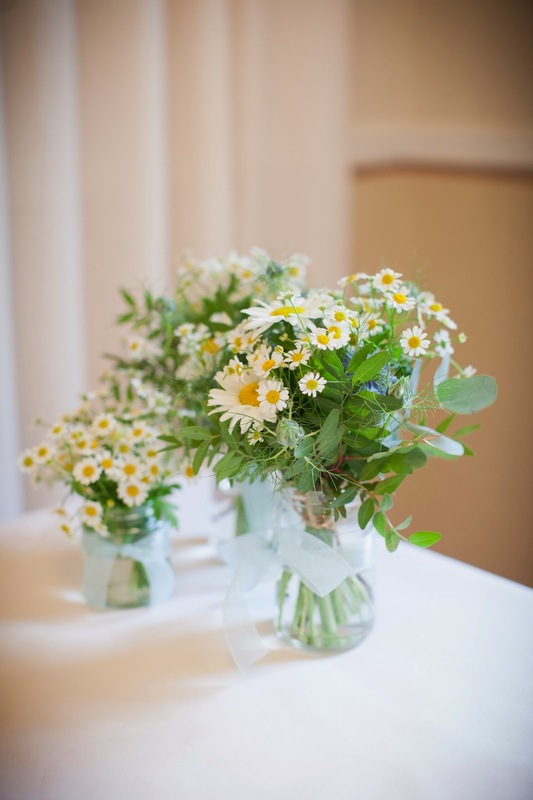 If you want a natural, rustic look for your wedding ask for seasonal flowers. Flowering herbs, buds and seed-heads also really helped created this informal, countryside look. This colour combination worked so well. I love bright colours for a wedding! 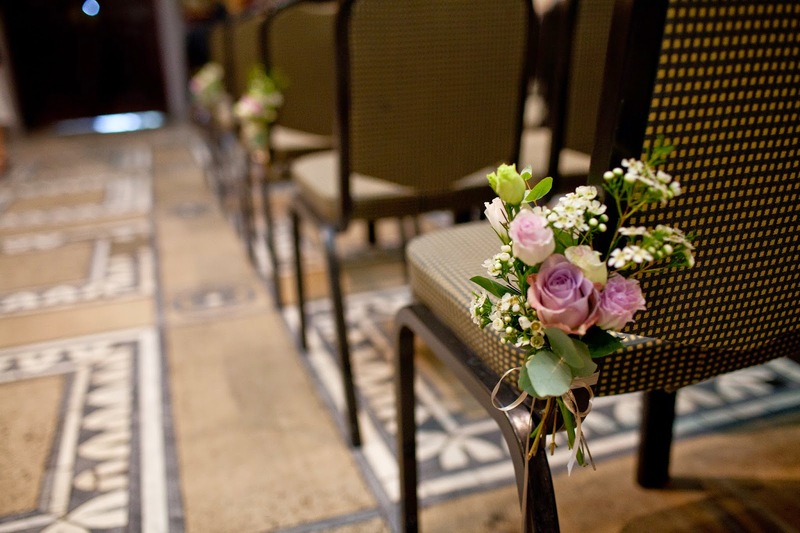 It really helps create a fun and relaxed atmosphere on the day. 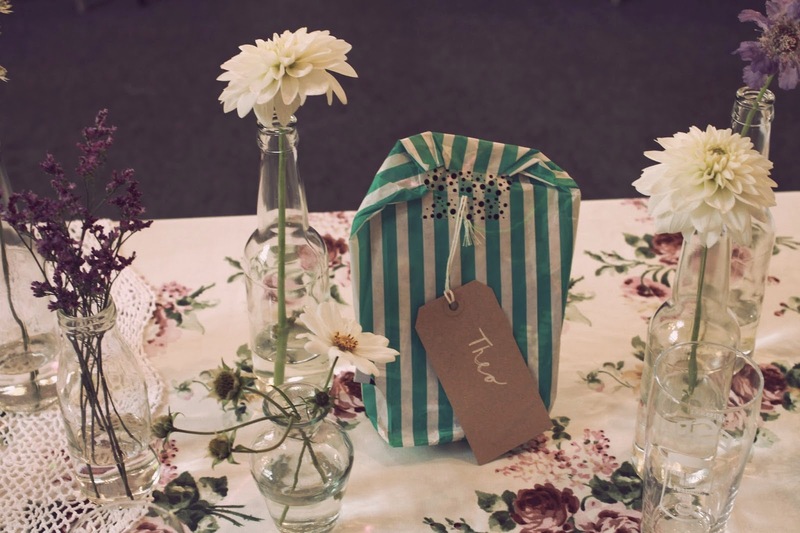 A wonderfully informal, home made wedding full of little details and personal touches. 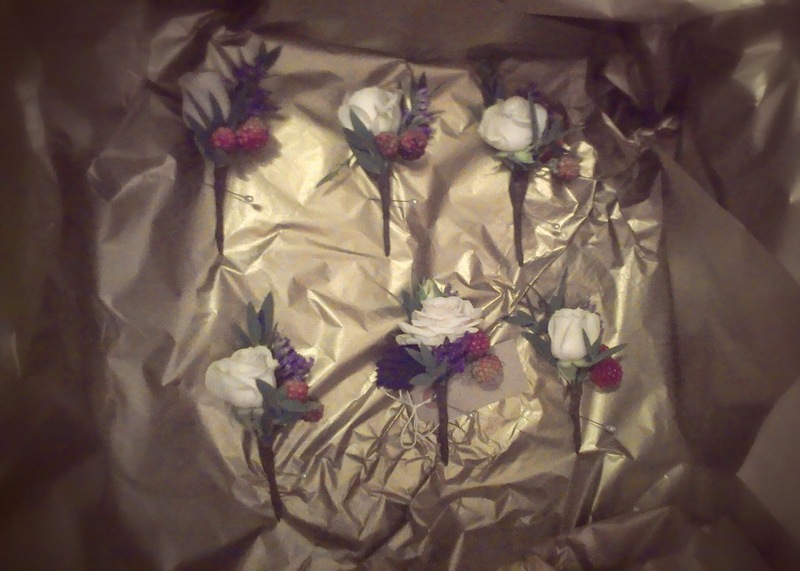 I used an eclectic mix of flowers, berries and grasses. It was important to Abigail and Rob that I used seasonal flowers. 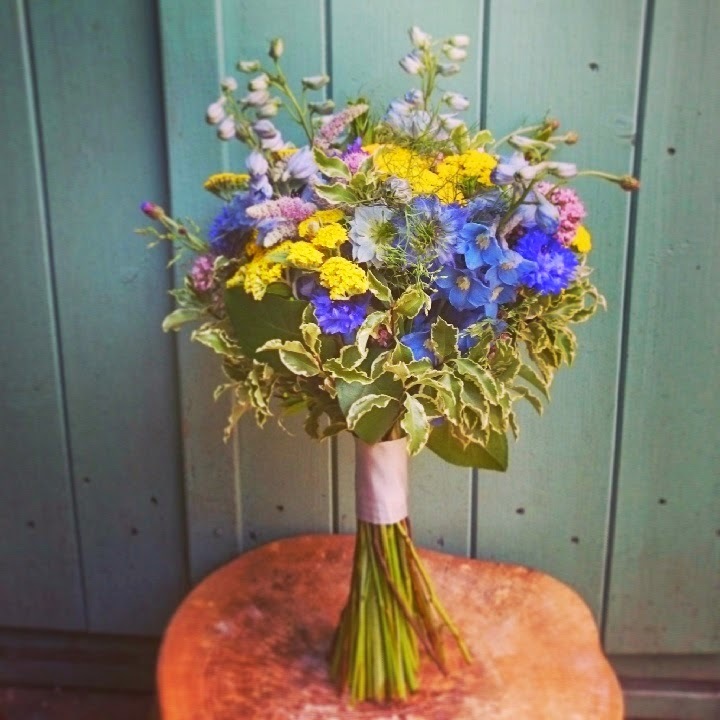 With the wedding being in late Summer/early Autumn there was an abundance of beauties for me to choose from and I was able to provide locally grown flowers for the day. 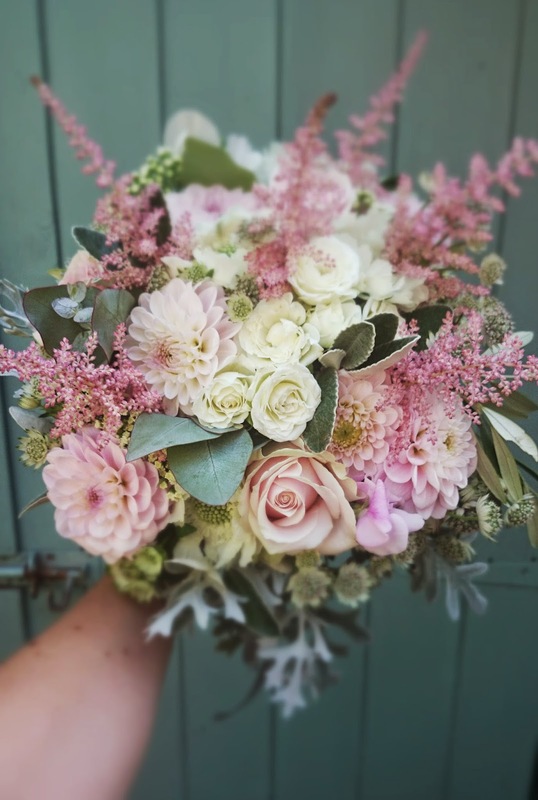 The bridal bouquet and bridesmaids posies are made up of Dahlias, Spray Roses, Scabious, Astrantia, Feverfew and Limonium. Grasses, berries and Autumn foliage add detail and help create the lovely, informal look. How to get an entire wedding in a small car! 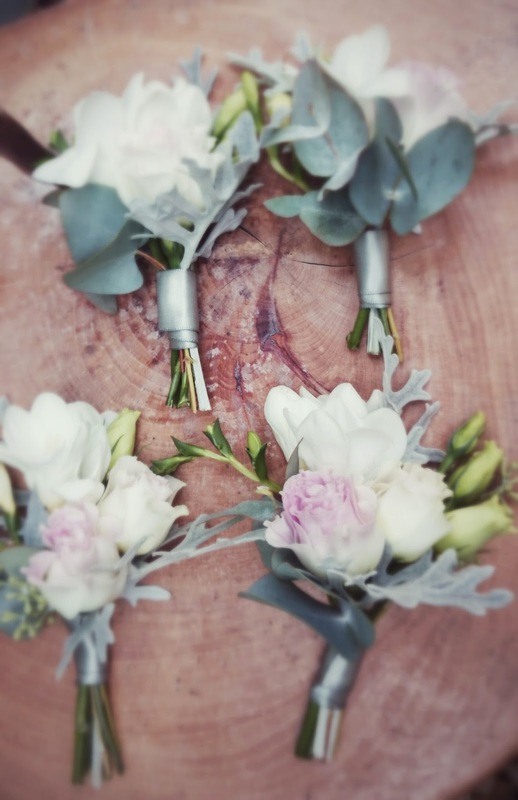 I love using these mixed bottles with single stems for weddings. 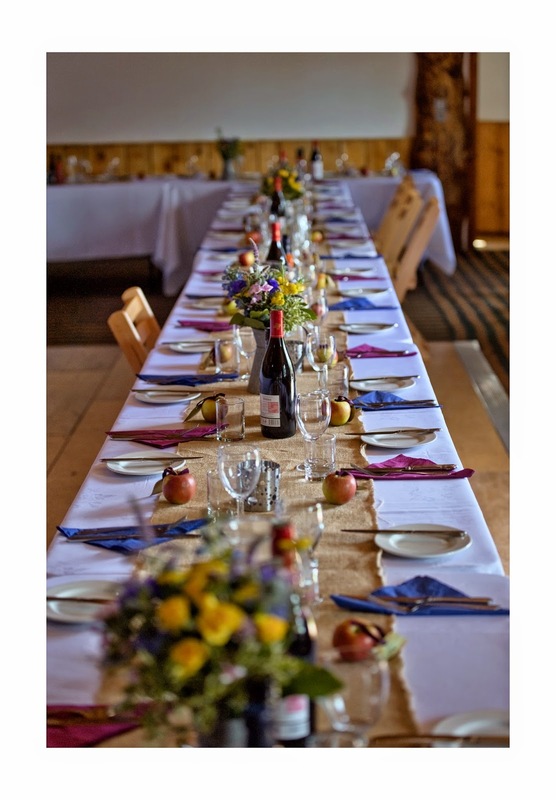 It looks so pretty here and is a very cost effective way of decorating your tables! 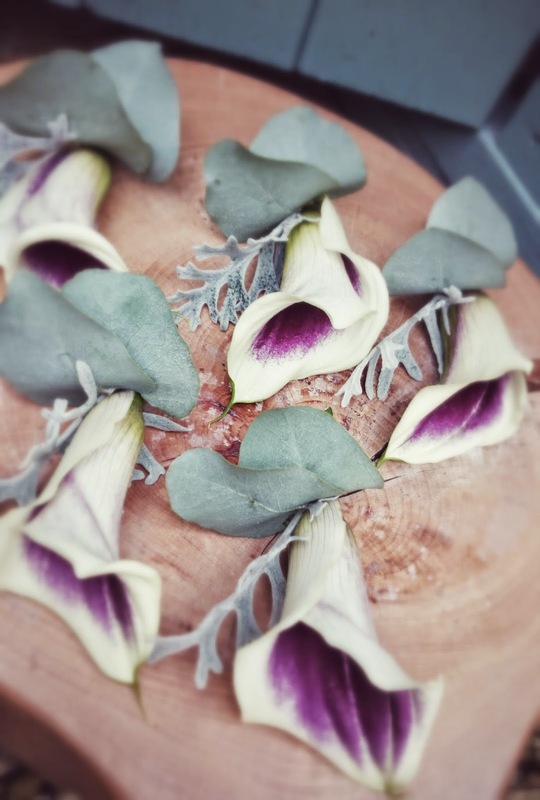 A brilliant way of getting the most out of your flowers on the day. 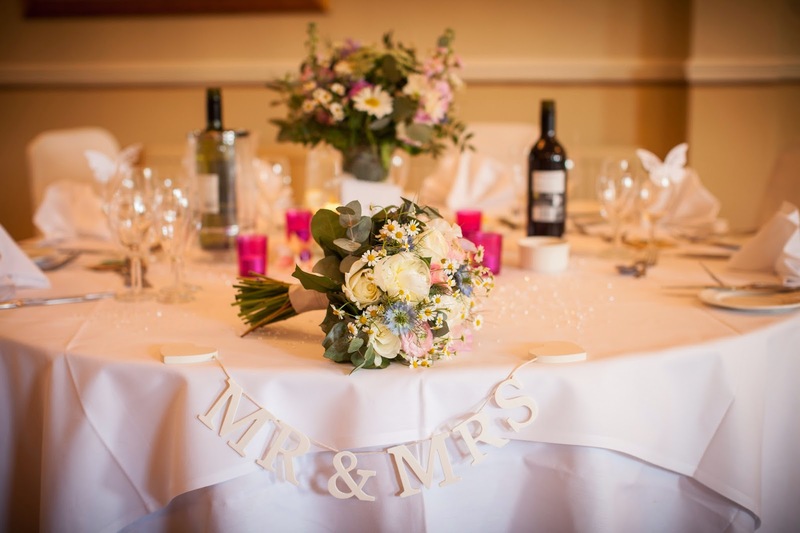 After your wedding breakfast use your table centres to fill up nooks and crannies, windowsills, mantelpieces and any little spaces. in Autumn when leaves are turning red. It’s lovely to have interesting little details like this. 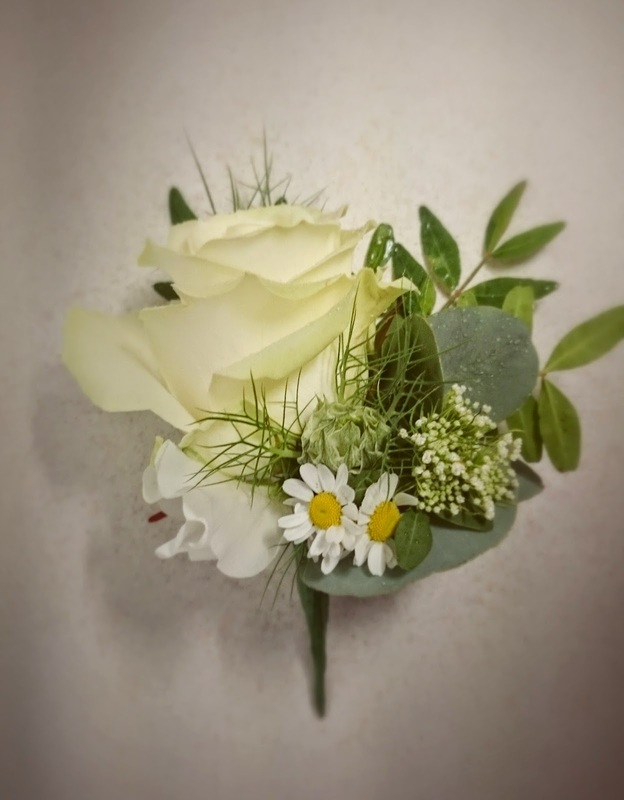 They add fun and character to your wedding flowers. I would choose. This is such a beautiful and delicate colour scheme. What a lovely and truly personal wedding.